We finally reached the last installment (so far) in the Rocky franchise: Creed. Released nearly a decade after its predecessor, Creed was the Rocky movie that no one expected. It paid proper homage to this universe and its characters, and I personally hope we get a franchise of Creed movies in the future. 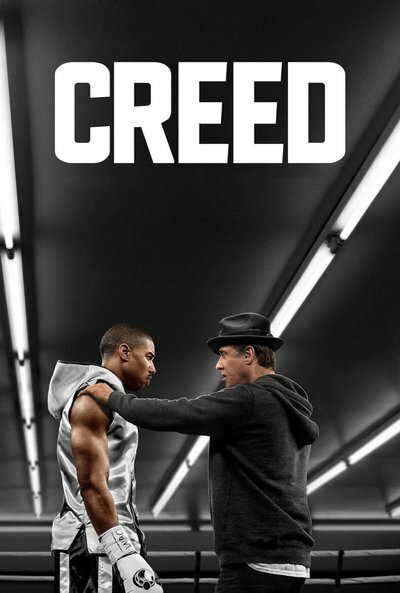 The story of Creed introduces us to Adonis Johnson, the son of the late, great Apollo Creed. During the events of Rocky IV, Apollo had an extramarital affair and dies before the birth of his son. Adonis was raised by his mother, who died a few years later. As a result, Donnie — as he preferred being called — bounced around from group home to group home. Growing up without his parents, he had to fend for himself. He developed an attitude that led to fights with the other children. Now relegated to an orphanage, Adonis gets a visit from a woman whom he’d never met. She reveals to him a piece of his past that remained a mystery: though he’d never met his father, he is the son of Apollo Creed. She offers to take him in and gives him the inheritance Apollo left behind: a stable, loving home; wealth; opportunities. His real inheritance, however, was his father’s fighting spirit. Despite having the world handed to him, Donnie never got over his childhood. It drove him to prove himself the only way he’d ever known: fighting. After several underground matches in Mexico, Donnie quits his well-paying job, leaves his adoptive mother’s mansion, and proceeds to move to Philadelphia to find Rocky. Of course, Balboa had no idea that Creed had a son, so he’s taken by surprise. “Time beat him. Time takes everybody out; it’s undefeated,” answers Balboa. Lesson: Sooner or later, no matter how great your potential is, and regardless of whether you fulfilled it or not, time is going to catch up to you. Your time on Earth is limited. Make the best of every opportunity that comes your way. When that’s not possible, find ways of creating your own opportunities. Don’t wait around for time to take you out. Now almost 70, Balboa has settled into the life of an older man; he’s no longer interested in the sport of boxing, in or outside the ring. However, after some reflection, he decides to train Donnie. Naturally, they head over to Mighty Mick’s Gym. One of the trainers there sees this as a great opportunity to market a fight between his fighter–his son–and Rocky’s protege, who’s kept his real identity under wraps. They accept the match and proceed to train. Donnie’s opponent is a highly ranked contender for the title. This was not supposed to be a fight that he could win. At this point, Donnie is an amateur boxer, with no professional record. 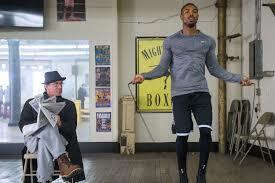 In order to avoid been scouted by his opponent, Balboa moves their training camp to a different boxing gym in Philly. Although Rocky can’t train him in the physical aspects of boxing, he still finds ways of mentoring Adonis. During their training, Rocky yells out to Adonis from outside the ring: “One step at a time. One punch at a time. One round at a time.” This mantra is, in my opinion, is a condensation of Rocky’s entire life and probably the most important lesson of the entire franchise. No matter what obstacles we face, no matter what opponents we face, there’s always something we can do. When you take action, no matter how small, it’s a win. If you stack enough small wins together, you start producing big wins. String together big wins together and there’s no telling what you might achieve. Maybe your big win is putting on muscle. It won’t happen overnight, but it will happen… one rep at a time, one set at a time, one training session at a time. Do that with consistency, and you’re guaranteed to meet your goal. Want to lose fat? That’s going to take time, but if you approach it from the standpoint of one meal at a time, one day at a time, one week at a time, you’ll eventually meet your goal. And if you get derailed, you know what to do: refocus on your original goal, breaking it down into its smallest parts, and get back to work. Look for small wins wherever you can get them, build momentum, and make bigger wins. After some hard training, Donnie puts all the lessons he’s learned together, combines them with his own desire for greatness, and pulls out an unexpected victory. After the bout, the world finds out about Donnie’s true identity; Adonis is now exposed as the son of the late Apollo Creed. The current Light Heavyweight Champion, in a situation reminiscent of the original Rocky, finds himself in need of an opponent. Once his manager hears the news about Donnie, he figures this would make a great payday for his fighter, who is facing legal trouble and possible jail time. They call Rocky to make the deal, and the fight is set. Adonis Creed is now set to take on the Light Heavyweight Champion, the best pound-for-pound fighter in the world: Ricky Conlin. Just as Donnie begins training for the biggest fight of his life, Rocky finds out he’s about to face his toughest opponent: cancer. Rocky’s ready to give up and join all the loved ones that he’s lost in the sweet relief of death. Coaching and community are a vital part of achieving any goal. It’s Adonis’ turn to be the coach. He promises to train as hard for his fight as Rocky fights his cancer. While it isn’t always possible to find people around you locally who care about the same things you do, you can find great communities of people on the internet. Together, you can encourage them and they can encourage you. And if that’s not working, you can always email us at coaching@controlaltfit.com and we’ll help try to give you the help you need. Find mentors whenever possible. There’s no point in re-inventing the wheel when plenty of people have already faced and conquered the challenges you face. Why stand alone when you can stand on the shoulders of giants? While Rocky deals with the side effects of chemo, Donnie channels all of his emotions into his training. He takes all of Rocky’s old school techniques and puts his own spin on them, internalizing his training and making it all his own. We hope that you’ve enjoyed this installment of “Keep Moving Forward: Lessons from The Rocky Franchise.” Next week, we’ll have our last part of this series, which will also contain a workout you can do while listening to Eye of the Tiger so you can channel your Inner Rocky.